As someone who is, to put it lightly, an organization freak, a country like Morocco can at first come on pretty strong. When things are not on time and nicely packaged I can tend to get a bit, well, impatient. Living here has been both a good growth experience and test of my limits since controlled chaos is one of the main functioning mechanisms of Tangier. It exists in the market, the workplace, weddings, traffic, even just getting together with a group of friends for a coffee. I actually got behind the wheel of a car once since settling here and while I was initially terrified, I was shocked by the ease of it all. You quite literally just go with the flow, seemingly following no rules except your own heightened awareness. In general, going with the flow of things and having a certain amount of flexibility (and patience) is a good rule of thumb here. Amid the daily bustle, chaos and schizophrenic weather, it is always nice to have some dependability. Among many things that I can always count on, one of them is my trusted vegetable guy. This is something I love about life here that just doesn’t happen in the same way in the states- I have been buying vegetables from this same man without fail for the past 3 years and many more to come, I’m sure. Always at the same market stand in Souk Barra (the Grand Socco), he consistently greets me with a big smile, a handshake and a long string of various ways to ask how I am doing on that particular day. What is great about this guy is that if for some reason I can’t seem to find something I have been craving, I give him a list of what I need, he disappears for several minutes and returns with handfuls of beets, basil, spinach, anything. Plus as a bonus, he always throws a couple lemons or apples into my bag insisting “cadeau, cadeau” (gift in French). This is precisely how I obtained two kilos of fresh pumpkin last week. I told him that 1 kilo was going into a tagine with loos (almonds) and lHam (meat) and he was thoroughly impressed by my display of Moroccan domesticity. Believe it or not, this is the first traditional tagine that I have attempted. I have made other things in our home tagine like shakshuka, but this was the first time I really dove headfirst into some hands-on Moroccan slow-cooking. This recipe was dictated to me over the phone from my wonderful mother-in-law who I swear has magic powers in the kitchen. Some of this magic, it seems, was transferred through the phone connection because oh-my-god this tagine is incredible. Seriously. The process and long cooking time may seem daunting, but it is surprisingly easy to put together and the result is beyond worth it. I’m considering remaking this for a fusion Moroccan-American Thanksgiving dinner next month since it will be our first holiday as a real-life married intercultural couple. Speaking of holidays… I should mention that this post is part of an online celebration happening today. I am so thrilled to be part of the official #VirtualPumpkinParty of 2016. Because who doesn’t love pumpkin and who doesn’t love parties. The real reason I bought two kilos of pumpkin last week is in anticipation of this day, knowing I would need some extra pumpkin around to try some of the other amazing recipes all of these fabulous bloggers are whipping up today. Check out the full list below the recipe! Begin by placing your meat in a large bowl + rubbing it thoroughly with the smen, ginger, turmeric, pepper, saffron, crushed bouillon cube, and salt (if you don’t mind getting a little dirty I would recommend using your hands for this). Make sure each piece is well covered in the mixture and set aside. Heat olive oil in a large tagine or in a large stew pot. Once it’s hot, sauté the garlic just a couple minutes until it begins to brown and add your meat, adjusting the heat to the lowest setting possible. Toss beef with the garlic and add parsley + onions. Mix everything together, place a lid on it and let it start cooking away over very low heat. This will cook for about 1 1/2-2 hours or until the meat is tender and falling away from the bone, the onions are completely soft and buttery and you have a bit of a sauce bubbling away at the bottom- you don't want it totally dry. During the cooking time, check every 20 minutes or so to give it a stir and flip the meat. Try not to add any water to the tagine since the onions will release their own juices to keep everything saucy. If for some reason the liquid dries up, just add a tiny bit of water or stock two tablespoons at a time. While the tagine is bubbling away, make the pumpkin topping. In a saucepan combine all of the ingredients and add just enough water to cover the bottom of the pan. Bring to a boil over medium heat, cover, and let it simmer for about 20 minutes. Stir occasionally until the pumpkin is soft all the way through. In a smaller pan, heat the canola oil and add blanched almonds. Fry, stirring frequently until they turn golden brown. Drain the oil, let cool and then pat the almonds dry with paper towels. Once everything is ready and the tagine is fully cooked, it's time to assemble. 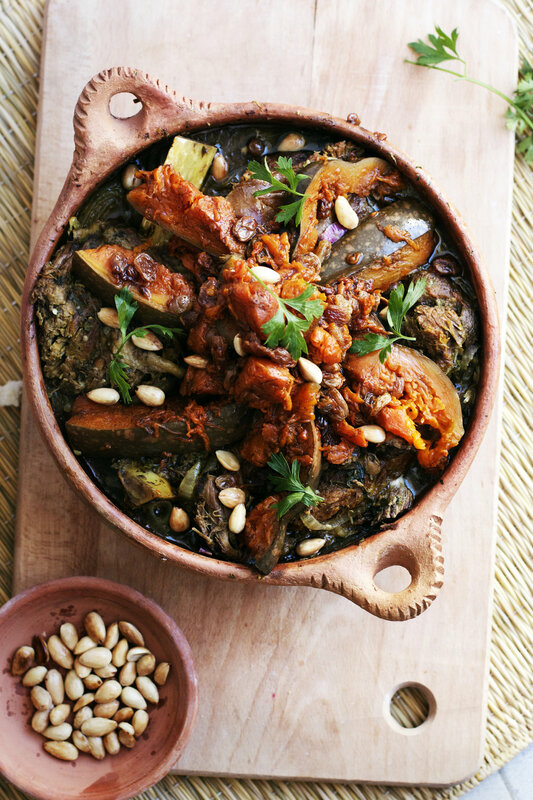 Arrange the cooked pumpkin and raisins among the meat + sprinkle your toasted almonds over the top. If you used a traditional tagine, I recommend eating it moroccan-style directly from the dish wish large hunks of fresh bread, or you can serve on plates with couscous or any other grain. It is, of course, delicious by itself, but it's always extra yummy to have something to soak up the sauce. *Smen is a traditional salted and fermented butter. It is similar to ghee but has an even stronger, richer flavor. You can often find it in global/ethnic foods stores (I found it once at Holy Land in Minneapolis), but you can also sub it for ghee if that's all you have access too. You could also use salted butter, but it won't have the same richness and depth. A huge thank you to Sara at Cake Over Steakand ­­Aimee at Twigg Studios for organizing this lovely virtual celebration of fall.